Primeline Group is the largest logistics company in Ireland, it operates a total of five depots across the British Isles and Ireland. It supports the overnight trucking of goods for a number of prominent international corporations, managing up to 7,000 jobs every single week. 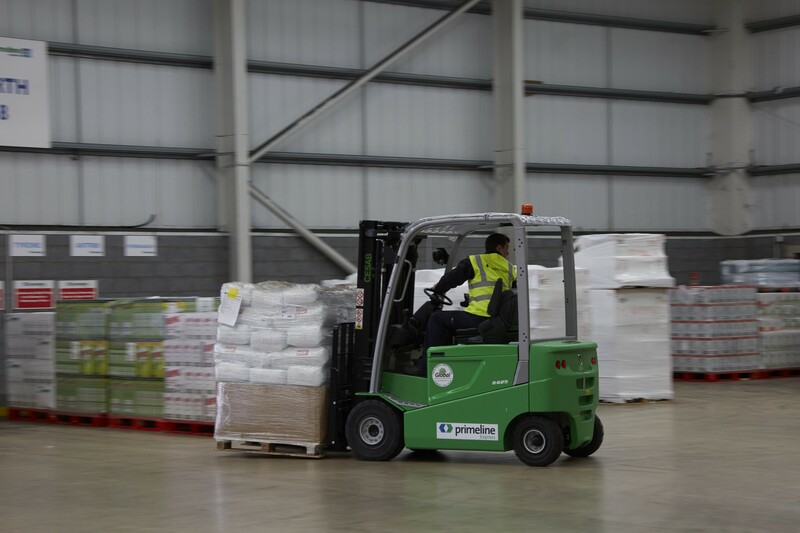 To ensure it always provides the best and most reliable logistics service, the manager of the Mallusk depot in Northern Ireland, Andrew Orr, made the decision to review Primeline Express’s warehouse and forklift equipment. Among the materials-handling dealerships he spoke with was Cesab dealership Global Material Handling. The Cesab B600 – This forklift is superb for high productivity, featuring an ergonomically-designed overhead guard to allow maximum visibility for the operator. The spacious cabin, multi-functional armrest and ease of access make these workhorses easy and comfortable to use. Maintenance requirements are low, so lifetime ownership costs are minimised. The Cesab P216 – From the P200 pallet trucks range, this machine is designed to be compact whilst delivering excellent manoeuvrability and pallet handling with its rounded chassis and centrally-mounted tiller arm. A total of nine products from the Cesab range were showcased to Primeline, with a great vote of confidence coming from the fact that Cesab products are designed and built in Europe in ISO 14001 certified factories, with the state of the art TPS* manufacturing system. In the end, eight B600 forklifts joined the Primeline fleet, as well as a P216 powered pallet truck. There were various challenges facing Global Material Handling in their dealing with Primeline. Corporations such as Volvo, Skechers, Dune Stores and Sony Entertainment rely on the services of Primeline Express for the UK and Ireland, with thousands of jobs managed every single week. The Warrington Depot is large, at 23,000 square metres, with around six trailers arriving in every 24 hour period, bringing goods that need to be offloaded as quickly as possible for preparation to be freighted onward. Furthermore, the Mallusk depot in Northern Ireland is one of the few companies in the whole of Ireland that provides next day delivery. In short, turnaround times are fast at Primeline, with downtime needing to be kept at an absolute minimum and issues needing to be handled swiftly. Global needed to be able to deliver on all these fronts. Feedback from Primeline was extremely positive for Global Material Handling. Before even meeting, the ISO 14001 certified factories and TPS* manufacturing system offered a lot of confidence. The Director of Global, Andy Evans, received warm praise right from first contact, with his sharp ability to identify Primeline’s needs and his swiftness to come back with proposals very welcome. Andrew Orr was quoted as saying that the new Cesab forklifts have “optimised our uptime” and that their “reliability” helps ensure that deadlines are always met. A positive and constructive working relationship was established between Primeline and Global, with great satisfaction on both sides of the deal. Primeline felt Global were able to meet all their needs and even open them up to new ideas. And, as a bonus, Global even included the addition of the Primeline logo on the side of all the new trucks, bringing a little extra satisfaction for an already-satisfied client. Car manufacturers, major retailers and global entertainment corporations rely on us for fast turnaround times, a rapid response and an ability to deal immediately with any issues. With the support of Global Material Handling and Cesab, our materials handling fleet is helping us meet those demands.